Over the Agnelizza Valley, chock full of the dead --- the skeletons of last year's battle, and the swollen corpses of this year's battle that has lasted a fortnight. And a shining skull grins next to the livid mask of a man killed yesterday. 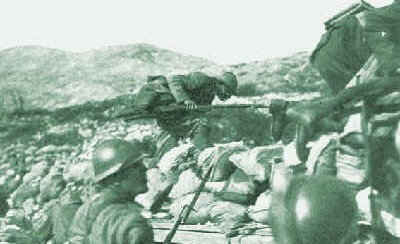 The Battle of Ortigara was not the largest or most costly battle on the Italian front, but for nineteen days in June of 1917 it was a microcosm of mountain front's warfare and the terrible attrition of the Great War. Ortigara is often called "the Calvary of the Alpini" with its useless sacrifice of Italy's finest troops. In a determined offensive on the Trentino Plateau, Italian General Ettore Mambretti seized strategic Monte Ortigara. However it was quickly retaken by Austrian General Artur von Mecenseffy in some of the bloodiest alpine fighting of the war. Austria lost 9,000 casualties, and the Italians sacrificed over 23,000 men (2,800 killed). The reality of two years of warfare on the Altipiano [starting in May of 1915] had seen endless Italian and Austrian raids, artillery duels and several pitched battles, primarily around Monte Pasubio. Little or no change occurred in the existing line, the old frontier, including the mighty Strafexpedition in the spring of 1916. Most of the Altipiano had been captured in this Austrian offensive, which very nearly broke out onto the vulnerable Venetian Plains. The Italian Army eventually halted the attack and immediately counterattacked; again back to the old lines. Where the Battle of Ortigara took place is a cluster of barren windswept mountains, soaring cliffs, boulder fields and sparse rocky meadows- the highest and northernmost ridge of the Trentino Plateau, the Altipiano. In 1917 the Italian High Command considered the strategic position of these peaks a dangerous bulge in the front, an area where Austria could break through and flank the Italian bastions of Monte Pasubio to the West or Monte Grappa in the East. Control of the Brenta River Valley or capture the entire plateau were additional considerations for the Italians. Indeed all of these fears came true in late 1917, although Pasubio and Grappa held on, barely. The Ortigara area also controlled the vital Passo dell'Agnella, which led into the strategic Val Sugana, the primary Austro-Hungarian supply route to their entire Altipiano line and a direct road to the city of Trento. 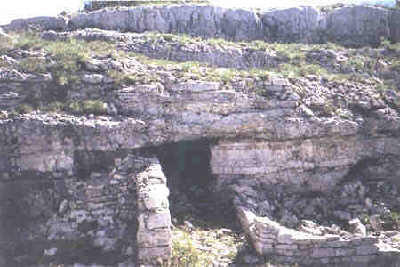 The Italian commanders knew this as well as the Austrians, who had fortified the area with Germanic tenacity and depth. Straightforward and well designed, the Italian attack seemed worthy of success, at least in theory. The focus would be along the northernmost three kilometers of the Altipiano frontline- Monte Ortigara. The Italian Twentieth Corps attacking force was made up of the 52nd Alpini Mountain Infantry Division and the 9th Bersaglieri Light Infantry Regiment, with the 29th Infantry Division- the combined Piedmonte and Regina [Queen's] Regiments, in reserve. These 52 battalions were all experienced troops, having fought across this mountain front, including the Isonzo River area, whose Carso and Bainsizza Plateaus were as harsh and rocky as this great northern spine of the Altipiano. 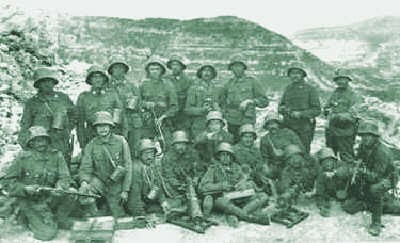 There were other Italian and Austro-Hungarian units across the Trentino Plateau. These troops and artillery are often added to the statistics and balance, although none participated in this battle. Those mentioned are those who fought. Facing the Italians was the 6th Austro-Hungarian Infantry Division. The 24 battalions of this division were the numerical size of 32 Italian battalions. These men were also seasoned veterans of mountain warfare, including two regiments from the Third or Eiserne Korps [Iron Corps] of elite Kaiserjager mountain infantry and Feldjager light infantry, who held the heights of Monte Ortigara. 428 Italian artillery pieces and 220 mortars faced 150 Austrian cannons and 75 mortars. These odds seem one sided but it must be noted that the Italians had a terrible supply route of twisting mountain roads and many of their cannons were light, mule packed alpine guns. Most of the Austrian mortars were heavy 305mm Skodas and all their artillery had a rapid supply line of valley railroad and mountain teleferique. To make matters worse, two Italian deserters had informed Austrian intelligence of the planned attack. On the evening of the 9th of June, 1917 both sides were on high alert. On June 10th the Italian barrage began at 0515 hours and finished at 1500. Following dangerously close to the explosions, Bersaglieri and Alpini rapidly overtook many Austrian positions. Only speed could capture these fortifications; once manned they were a deathtrap of wire entanglements and machinegun bunkers. The Austrian trenches and tunnels were deep, often with three meters of solid rock overhead. 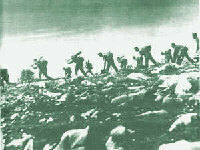 On the highest peaks the Alpini continued the attack. Their battalions captured the summits of Monte Chiesa, Corno de Segala, Peak 2003, as well as Peak 2101 of Monte Ortigara. Many points in this wilderness were known only by their elevation. As with the entire front, their new, often tragic names would appear after the war. Passo del'Agnella was tenuously captured, with the front line running directly through its center. On the second day [June 11th] mountain clouds and heavy rain turning to snow engulfed the area. The Italian commanders were forced to delay the offensive. Battles continued to rage between platoon and patrol within the clouds. Artillery was for the most part useless. On June 15th the fog cleared. Earlier that morning, 0230 to be exact, three battalions of Kaiserjager retook Peak 2101 despite the fresh snow and ice. Four days later the Alpini once more held its heights, in a similar lightening raid. Hidden in cavern or behind ridge, the enemy artillery and the very nature of these bare stone mountains made existence hell. If your forces did not capture or recover established defensive positions, digging new trenches was an industrial effort, near impossible with infantry hand tools. Ricocheting shrapnel, rock and bullets would take their additional toll. The Italians attempted counter-battery with aerial bombardment. On the morning of June 18th 145 Italian aircraft, including 26 Caproni heavy bombers, attacked Austrian batteries, teleferiques, ammunition and supply dumps to the west of Monte Ortigara and in Val Sugana. Superficial damage to the latter was great and several large explosions were observed. Once again the Austrians hunkered in their caverns and waited for the inevitable Italian attack. As is often said of this war's battles, Ortigara began to "take on a life of its own." With two elite corps of mountain troops facing each other there was no letdown in the fighting. Every attack was immediately countered; the resulting casualties surpassed what was typical of this war's terrible attrition- in the sardonic humor of the Italian soldati, "meat for the cannons." The Austrians were perfecting the recent Germanic concept of "storm troops," heavily armed infantry infiltrating the enemy's weaker areas, however scarce these places were on Ortigara. 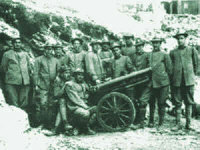 The Alpini were not so tactically advanced, but relied on their traditional courage and pride, wheeling their mountain artillery pieces into repeated attacks as direct fire weapons against Austrian strong points. The crux of this fight occurred when the Italians captured the primary and highest point of Monte Ortigara, Peak 2105, on the 19th of June 1917. In 45 minutes the Alpini of seven battalions, led by the local men of Battalione Sette Comuni, captured over one thousand Austrians, five cannons and 14 machineguns. In brilliant sunshine and calm morning atmosphere this was the high tide of the Italian offensive. It did not take long for the Austrians to retaliate. On the 22nd of June Austrian artillery, including new batteries brought up from other parts of the front, began a nonstop pounding of the Italian positions. Two hundred and fifty tons of high explosive shells were dropped into these two square kilometers. In the last hour of fire, 90 tons of artillery and mortar rounds were focused on the Italian stronghold- Peak 2105. The effect of airburst shrapnel, delayed high explosive shells, stone splinters and ricochet on the solid rock was murderous. High angle mortar fire hit the Alpini fortunate enough to escape gunfire on the leeward slopes. At 0230 hours on June 25th, the darkness was hideously illuminated by Austrian flamethrowers, leading seven battalions of Austrian Kaiserschutzen mountain troop reservists and regular infantry. The remaining reserves of the 52nd Alpini and the Queen's Own Regiment were thrown into the battle. Unit histories from both sides report fierce hand to hand combat with club, pick-mattock, knife and rocks. By morning the battle was over, with 1000 Italians wounded and/or captured, a similar number killed and Monte Ortigara in Austrian hands. In the morning calm, gas shells were fired onto Peaks 2101, 2003, and Passo del'Agnella accompanied by a creeping barrage of high explosive and waves of Austro-Hungarian infantry, the EiserneKorps final reserves. The smoke of numerous brush fires compounded the deadly situation. Italians were unaware of the deadly gas until it was too late. This was only the second time poison gas had been used on this entire Alpine Front, where both sides had abstained from using it, due to either [arguably] chivalry or [more likely] the unpredictable mountain atmosphere. The Austrians captured the pass and all four peaks. The next day [June 26th] a valiant counterattack by the remains of two Alpini battalions reinforced by regular infantry survivors [in total numbering little more than 200 men] recaptured Peak 2003 and the old trenches at Passo dell'Agnella. These troops, considered a rearguard, were withdrawn to what must have seemed ancient starting lines on the 29th of June 1917. The Battle of Ortigara was over, nothing had changed. The mountain itself was also hit, turned upside down, destroyed, as were the most severe points on the Carso Front. In an incredibly narrow space, men by the tens of thousands were nailed to the rock under artillery fire hitting them from every inch on the horizon, and under avalanches of fire, clouds of gas, and torrents of liquid flame, the three peaks were won, lost, retaken and finally abandoned when we no longer had a single battalion with which to continue the struggle. The losses on Ortigara devastated the Italian Alpine Corps. The 52nd Alpini Division suffered 12,633 casualties to their 15,000 men. Total Italian casualties were 2865 killed in action or died of wounds, 16734 seriously wounded, 2600 captured and 3000 missing in action- totaling 25199. In this narrow area of three peaks and three kilometers the Austrian Third Corps lost 992 killed, 6321 wounded and 1515 missing or captured- totaling 8828. The Iron Corps report to the Austrian High Command read, "the battalions returning from the Ortigara inferno are dross." To the Italian Alpini, Army and people these peaks will forever be known as la tomba degli alpini [the tomb of the Alpini] or il Calvario degli Alpini [the Calvary of the Alpini]. The Altipiano front line would eventually be breached by a combined Austrian and German offensive in October of 1917, known as the Twelfth Battle of the Isonzo or Caporetto. Few returned to the area of Ortigara until after the war, when the remains of those lost were recovered. Italian soldiers and Austrian POWs performed initial searches. Soon the loved ones of the fallen took up the search. Memorials were put up for both sides in the early 1920s. To this day bodies are found. Today, Ortigara is a sparse wilderness surrounded by rich meadows and deep forests. Only at the height of summer will one find hardy mountain flowers and tufts of grass between the rocks or see the occasional shepherd and his flock. Despite the scavenging for brass by locals during the impoverished Depression, underfoot the Ortigara battlefield remains half stone, half iron artillery fragments. [This statement is more realistic than poetic.] Few come to these lonely peaks except on the second Sunday of each July, when local Altipiani, veterans of both sides and relatives of the dead make a pilgrimage, to pay their respects at graveyards and a memorial atop Monte Ortigara, whose inscriptions appeals per non dimenticare [not to forget].